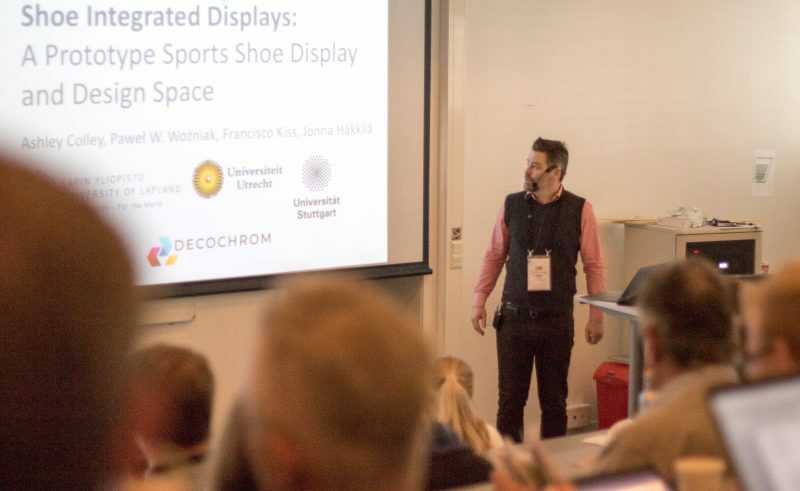 Ashley Colley from the University of Lapland, presented the initial investigation and design space for a display integrated into a smart running shoe at NordiCHI 2018 in Oslo, Norway. NordiCHI is the biannual conference and the main Nordic forum for Human-Computer Interaction (HCI) research. The focus of this paper was the design space for displays integrated into a shoe, which will be one of the pilot cases for DecoChrom applications in the area of Sport, Health and Well-being. Colley, A., Woźniak, P.W., Kiss, F. and Häkkilä, J., 2018, September. Shoe integrated displays: a prototype sports shoe display and design space. 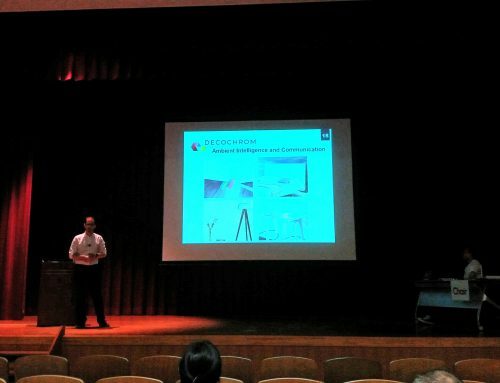 In Proceedings of the 10th Nordic Conference on Human-Computer Interaction (pp. 39-46). ACM. In this paper, we address shoes as a platform for wearable displays. To open research on the area, we present a functional prototype of a display integrated to a sports shoe. The prototype utilizes three different areas of LEDs attached to the shoe as a display mechanism, and indicates the wearer’s running pace relative to a preset target pace. To explore perceptions of the concept, and ideate further on the topic, we conducted semi-structured interviews with a group of regular runners. Initial findings suggest that the ambient, peripheral visibility of the sports shoe display is appreciated as fitting well to the running activity. To provide a structure for future work in the area we present a design space for shoe displays, identifying aspects such as scope of visibility, content, visualization style, and usage context.